Low back pain is very common. Around 80% of people have it at least once in their life. Sometimes just the normal things we do can cause some back pain. Usually it is not serious and will get better by itself. In almost all cases we don't need to know exactly what's causing your back pain to treat it. This is called nonspecific low back pain. We only need to find out the exact cause if you're not getting better as quickly as we would expect. Your spine is made up of bones called vertebrae. 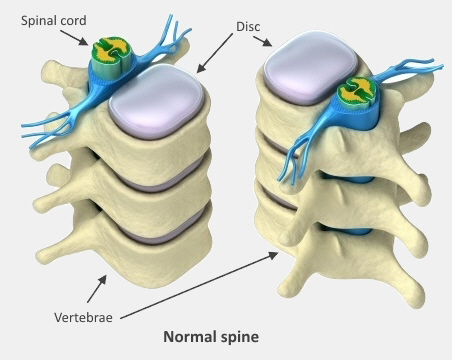 There are discs between the vertebrae, which act as shock absorbers and allow your spine to be flexible. Strong bands of tissue called ligaments support your spine, and muscles make it move. Joints between the vertebrae, called facet joints, guide the way it moves. Your spine protects your spinal cord, which contains nerves to and from your brain. Nerves from your spinal cord come out from between the vertebrae and continue to other parts of your body. The medical name for your lower back is your lumbosacral (lum-bo-sak-ral) spine. Pain is your body's way of letting you know that something's not right. Low back pain is usually mechanical, which means something inside your lower back has been disturbed, but not necessarily badly damaged. We treat this pain with particular movements, postures, and exercises. You can read more about how to treat low back pain. Inflammation is a less common cause of back pain. This happens when you have an infection, or when your own immune system attacks your body by mistake. When this happens we treat it with medicine. Nonspecific back pain can range from mild to severe. It can happen straight after you lift something heavy or twist awkwardly. Sometimes it happens for no clear reason. The pain is usually in one part of your lower back, but it might spread to your buttocks, thighs, lower legs, or feet. Lying down flat or standing and walking usually eases the pain. Coughing, sneezing, or sitting for too long often makes it worse. If the pain began when you bent forwards, then sitting and bending movements – such as brushing your teeth, putting on shoes and socks, getting up out of a chair – will make it worse. In this case, doing the modified push-up exercise may help to ease your pain. One of the best things you can do to make your back pain better is to keep active. Keep walking and get back to your normal daily activities and work as soon as possible. Some people find exercises they can do themselves are helpful. Others prefer physical treatment by a chiropractor, osteopath, or physiotherapist. In most cases, the pain gets better within three months, even if it doesn't completely go away. There are some things that you can do to help stop back pain returning. When might it be more serious? If you have any concerns about your back pain, or if you have any of the symptoms of more serious back pain or persistent or chronic pain, see your GP. They will be able to assess what's happening and give advice about treatment.